A conveyance of land in Oregon, or of any estate or interest therein located in Oregon, can be created, transferred, or declared by a deed in writing and should be signed by the person of lawful age (or their agent) from whom the estate or interest is intended to pass. The deed must then be acknowledged or proved and recorded in the county where the property is located (93.010). The statutory forms for a conveyance provided in Chapter 93 of the Oregon Revised Statutes are sufficient to use for a real estate transaction in this state. The use of the statutory forms is permissive, but not mandatory. The forms can be altered according to the circumstances and intentions of the party transferring the property. Alternatively, other forms may be used in a conveyance of real property, provided that they meet requirements necessary for recording. Quitclaim deeds and warranty deeds are commonly used in Oregon to convey real property or an interest in real property. Any person of lawful age has the power to hold and convey property or an interest in real property in Oregon. Property ownership can be sole or as tenants in common. According to the Oregon Statutes, the only limitation on alien ownership of property is that the application to purchase state-owned lands is limited to an individual 18 years of age or older who is a U.S. citizen or has declared an intention to become a U.S. citizen. This provision also applies to aliens making mining claims on state land (273.255). A grant or conveyance of land or of interest therein will not be void due to the fact that at the time of its execution the lands were in the actual possession of another person claiming adversely (93.130). The manner in which title is held will dictate the rights of the owner when he or she conveys property or an interest in property. 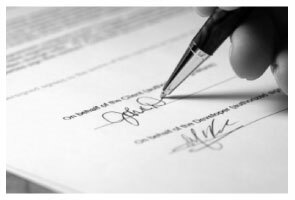 A deed executed in Oregon should be signed by the grantor (or grantors) and acknowledged before any judge of the Supreme Court, circuit or county judge, justice of the peace, or notary public within the state of Oregon (93.410). A county clerk may refuse a real estate deed for recordation if it does not contain the original signatures of the person executing the instrument and the officer before whom the acknowledgment was made (93.804). Although a witness is not required, proof of the execution of any conveyance can also be made before an officer who is authorized to take acknowledgments of deeds, and should be made by a subscribing witness, who should state the place of residence of the witness, and that the witness knew the person described in and who executed the conveyance (93.440). When presenting an instrument for recordation, additional requirements must be met in order for the document to be accepted. For instance, Oregon Statutes require that a mandatory statement, detailed in 93.040, be included in the body of an instrument that is transferring or contracting to transfer fee title to real property. Owner's sale agreements and earnest money receipts require a statement detailed in 93.040(2) of the Oregon Revised Statutes. To give constructive notice of an interest in real property, a person must have documentation of the interest recorded in the indexes maintained under ORS 205.130 in the county where the property is located. The recordation, and no other record, will constitute constructive notice to any person of the existence, except for the limitations described in 93.643. In Oregon, every conveyance, deed, land sale contract, assignment of all or any portion of a seller's or purchaser's interest in a land sale contract or other agreement or memorandum thereof affecting the title to real property within the state that is not recorded as provided by law will be void as against any subsequent purchaser (and as against the heirs and assigns of the subsequent purchaser) in good faith and for a valuable consideration of the same real property, or portion thereof, whose conveyance or other instrument in writing is first filed for record (93.640). This is known as a race-notice recording statute. Eileen B. said: Great form needs more instructions however but aside from that is perfect solution for my needs. Marie A. said: Easy to download, helpful information and forms quick when you need them. Thank you Deeds.com. Reply from Staff: Thank you Marie! Bobby W. said: The site delivered just what it promised - I needed a specific deed formatted for a specific county/state, and they delivered it at a great price. One note for improvement - it is not intuitively obvious that I could go back and re-download if necessary and this caused me stress, but a follow up email alleviated this. Great service! Reply from Staff: Thank you for the kind words Bobby, have a great day! Kathleen Z. said: Very simple. By creating the deed and filing it myself, I am saving a legal fee of $300! Abigail Frances B. said: Thanks for the easy download, clear instructions, good price- I'm looking forward to filling them out.